2016 is looking to be another "early year"
due to the hot global temperatures and an early Spring. Blush Lane is THE place to find fresh, ripe farm-direct organic produce. Direct from our own orchard and the local organic community, enjoy an exceptional variety of BC and Alberta organic produce this summer. Every type of fruit has several varieties that ripen at different times, so there is a range of dates for each, listed in order of harvest. Every week there will be something new! VISIT us at the Roots on Whyte Community Building to celebrate the Opening of our new store in Old Strathcona. There will be entertainment, lots of demos and nibbles, free hay rides door prizes and sweet specials! 700 Kilometers outside of Calgary and passed almost just as many fruit stands, lies the Similkameen Valley. The valley is the lesser known little brother of the well known Okanagan Valley, and though smaller, its just as full with fruit orchards, especially certified organic orchards. The main centers in the valley are Cawston and Keremeos. Like in the Okanagan, the streets of both towns are lined with fruit stands. One of these stands, just outside of Keremeos, is the Blush Lane fruit stand and behind the stand, is the Blush Lane Organic Orchard. I was lucky enough to have spent four days on the Blush Lane orchard, learning about tree fruit production, touring local organic orchards and meeting the amazing people who produce our food. I have been working for Blush Lane for over a year, and in that year have seen a lot of produce and a lot of produce boxes. On each of these boxes is a label, stating the organic certifying body and the name of the farm it comes from. As time goes on you start to notice patterns, whenever you see especially beautiful produce, the names of a handful of farms is usually the source. The chance to meet some of these farmers, is a real honour, especially for someone, like myself, who wants to farm. You can't spend much time on the orchard before you do get to meet one of the local organic farmers. There are farmers dropping off their amazing produce, to be shipped to Calgary within 24 hours, regularly throughout the day. Rob Horricks, one of the Blush Lane owners, spends his summers taking care of the Blush Lane orchard and ensuring the farmers get a fair price for their product and our customers get the highest quality organic produce. Cutting out the middle man allows the farmers to get a better price for their produce and because of that, they bring their produce to Rob at the orchard, first. Handing the farmer a cheque for their produce as they're dropping it off, is, unfortunately, a rare thing. Usually your lucky to get payment within 30 days of selling produce. Because Rob does this, not only does he get the freshest produce, he also gets the highest quality. A number of these farmers were nice enough to let me spend some time touring around their farm and picking their brains about the organic industry. One was Fred Danenhower, of Danenhower and Daughters farm. Fred and his family have a main orchard, where they live, and an orchard they lease close by. The Danenhowers provide us with everyone's favourite apple, the Honeycrisp, along with a number of other great varieties. 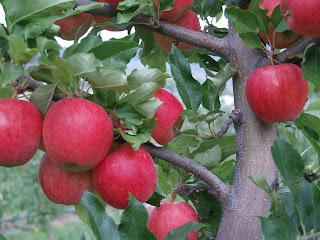 While I was visiting, the Danenhowers were doing summer pruning on their Fuji apples. Summer pruning means removing the foliage blocking the apples from the sunlight. 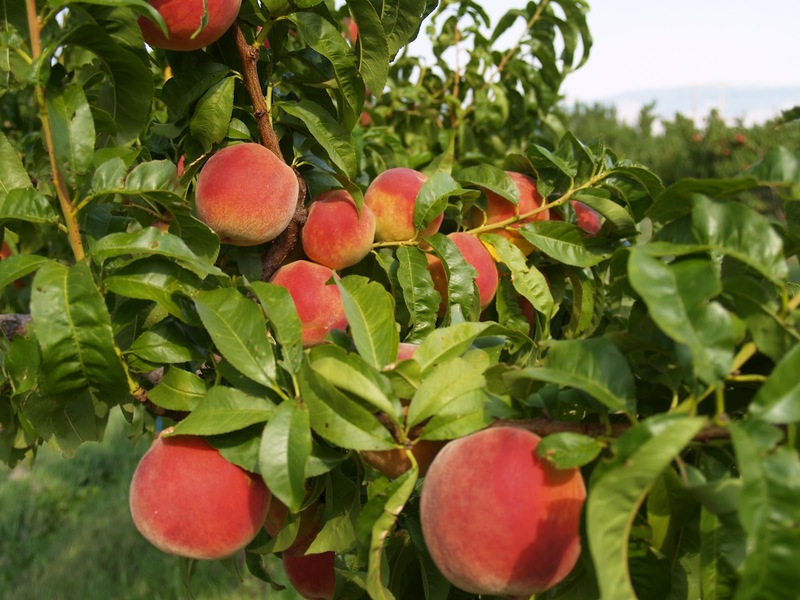 During the hottest part of the summer, you need foliage to protect the fruit from getting sunburned. But in the late summer/early fall, you can prune it off, without risk of sun damage. Pruning the foliage helps improve colour on the apple, resulting in a more marketable piece of fruit. The one thing that the Danenhowers and every other farmer I talked to kept bringing up was how late all the fruit was this season. Most were worried about even being able to harvest some of their later varieties, like Pink Lady. 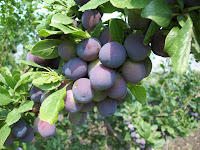 Most of the fruit was up to three weeks later than other years. That's why we haven't seen all of the apple varieties customers are used to at this time of the year, but its also the reason we get to be spoiled with amazing summer fruit a bit longer then other years. Another farmer who let me pick his brain was Art Nugteren, from Art and Lina's Garden. Art and Lina grow the most amazing cherry tomatoes I've ever had. Everything that comes off this farm just seems special: it stands out from among the rest. Along with cherry tomatoes, they grow amazing peppers, zucchini, roma tomatoes, beans, corn, etc. Art showed me around and gave me a vision of the whole process, start to finish. I saw the greenhouses where they start all their own transplants and where they grow their transplants until they're ready to go in the ground. I got to see the end process as well, as Lina and her family were busy picking peppers while I was visiting. We have a special friendship with both of these farmers, not only do they provide us with great produce, but both of their daughters work at the Blush Lane fruit stand outside the orchard. Fred Danenhower's daughter is planning on moving to Calgary and you may be able to hear all about her Mom and Dad's orchard as she joins our Blush Lane team at the Calgary Farmers Market. Rob has also set up a university fund for Art's daughter, as the profits from her Dad's cherry tomatoes sold at the fruit stand will help her pay for her schooling. freshest, highest quality produce, but what I didn't understand was how much the farmers benefit from our arrangement. These farmers were some of the hardest working, most dedicated people I've met. I love being part of a company that places a priority on ensuring they get a fair price for their hard work and amazing products. I love being part of the bridge between farmer and consumer. It's great to connect farmers with new markets and new customers, who appreciate their produce. Next time you're at one of our Blush Lane locations, don't be afraid to ask where your produce is coming from. You may get to hear about one of the great people that grow our food. 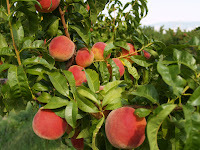 When your salivating over an amazing peach in your home, you can feel good knowing your helping one of those great farmers. 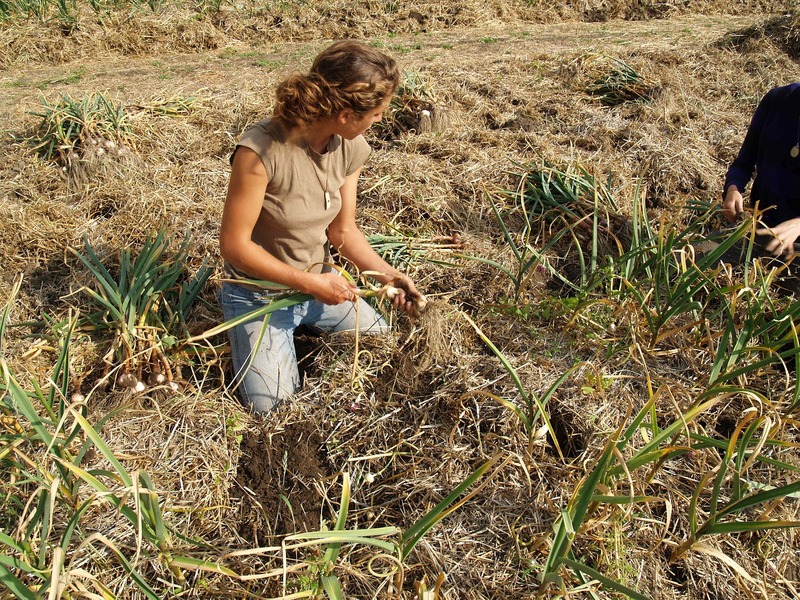 Farmers who choose to grow organically, sell locally and follow their passion by making a living farming. By taking care of their land, they're ensuring that not only their children, but also their grandchildren will have a future farming. Being a small part of this, to me, is something worth being proud of. 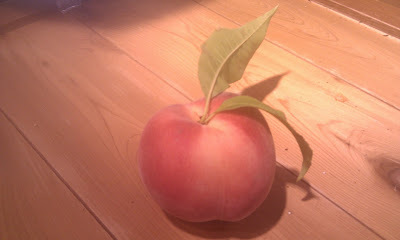 For obvious reasons at this time of year, the BC fruit tends to get the spotlight. But I wanted to tell you about all the great BC and Alberta veggies we have on our shelves. The past few weeks have seen a transformation of the veg coolers from Northern US states to almost nearly 100% Canadian produce. 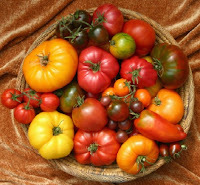 Here`s a photo of Rob`s heirloom tomatoes, straight from the Blush Lane Organic Orchard in Keremeos, BC. The garlic (Red Russian variety) is also from BC, and Art and Lina grew the Roma and cherry tomatoes. This week we also have peppers arriving from them, and below I am linking to the post, back in April, of the starts in their greenhouse. Hard to believe that they are now reaping the harvest of these tiny plants. If you`ve ever grown your own food, you know the gratification of that first, ripe tomato, or the unmatched taste of the first picking of spinach. 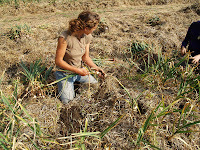 We`re lucky to have great people like Art and Lina to grow our food for us: it doesn`t get any better than this! On this wall we have some more great BC and Alberta veg: BC celery, red peppers, bunched beets, cauliflower, and corn; Art and Lina`s eggplant, zucchini, mini sweet peppers and herbs; Parsnips, leeks, and field cukes; Alberta red spring onions, herbs and potatoes from Busy Bea`s Market Garden. Enjoy it while it lasts; soon enough we`ll be back in March, lamenting the poor quality of the produce, dreaming of this time of year. Somebody pinch me! Today, while putting out the White Champagne Peaches in preparation for the Farmer's Market tomorrow, I FOUND OUR MASCOT!! I must explain: a few months ago, they got me to draw up a graphic of a peach, to use as an alternate logo to represent our company. 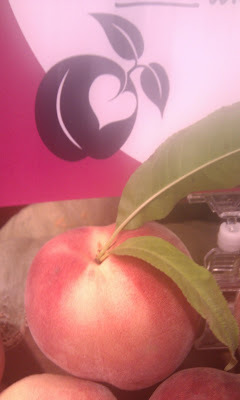 So, in the photo above you see the peach I drew, which is on our new sign stock. Below it, you see the real-life mascot! It even nearly has a heart-shaped blush! I guess life really does inspire art! Our Freestone Peaches are abundant, juicy, delicious, and you should buy some: If you buy 3 or more cases, you'll get them for $40 a case. There's only about 3 weeks left of these babies, so get them now and get your preserving done; the price will not get lower this year on these, nor could the taste get any better! I'll have lots available for pickup at Northlands Farmer's Market this Tuesday from 3:30-7:00, or visit our Aspen Woods store or Calgary Farmer's Market location. I always say that we have the best peaches in town: I can be confident in that, the way that only a person who has a peach on her business card can be! If you don't believe me, come visit us and try one! Looking forward to sending lots and lots of peachy love your way this week! "Best of Blush" showcases the latest and greatest products and produce from Blush Lane. From Sunworks Farms organic, free-range meats to Ocean Wise fish and hand-selected grocery products, we have it all!